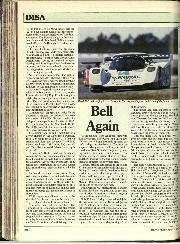 Last March the All-American Racers Toyota Eagle Mk3 won the Sebring 12 Hours, but doubts remained that the little 2.1-litre, four-cylinder turbocharged engine could last around the clock. 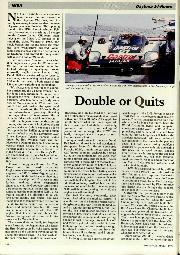 It did so admirably at Daytona on January 30/31 as PJ Jones, Mark Dismore and Rocky Moran won the Rolex 24 Hours with ease, despite a 74-minute pit stop on Sunday morning while the transaxle was changed. Anyone who skipped Saturday's tedium, and turned up at the Florida circuit at breakfast time on Sunday, would have shared the delights and agonies of the Toyota, Jaguar and Momo Nissan teams. Jones' Toyota was in control of the race almost from the start, as the Juan-Manuel Fangio II/Andy Wallace/Kenny Acheson Toyota was soon in trouble with a broken third gear and retired at sunrise on Sunday with a cooked engine. 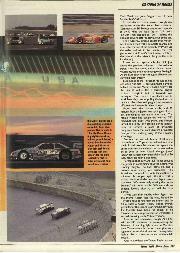 The TWR-run Bud Light Jaguar team lost two of its three XJR-12s early on, David Brabham's with a blown oil seal on the rear of the V12 engine and the reserve car, which featured some new ideas with Le Mans in mind, with a handling problem. Reinhold Joest's two Porsche 962Cs, strongly fancied for a good finish, retired during the evening with engine failures, just as they did last year. One had a water leak, an all too common happening on the flat-six, the other experienced a sudden blow-up. 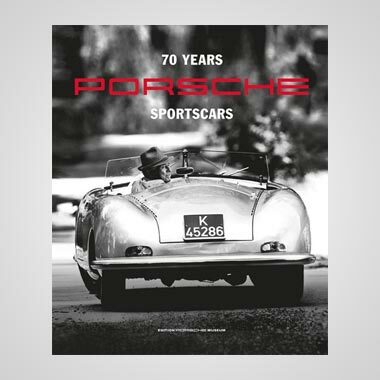 The famed Porsche reliability seems to have gone to pot these days. 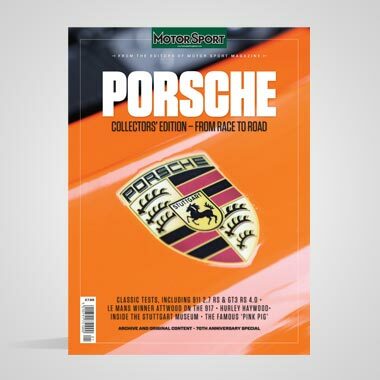 Whether this is due to the age of the engines or the unavailability of Weissach rebuilds isn't known, but no longer can the Porsches be trusted to be lining up in marque formation when the marathon comes to an end. 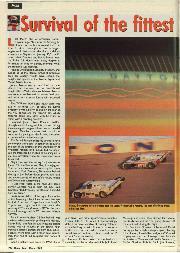 Night time was the setting for Jones versus Jones, PJ in the Toyota and Davy in the Jaguar. 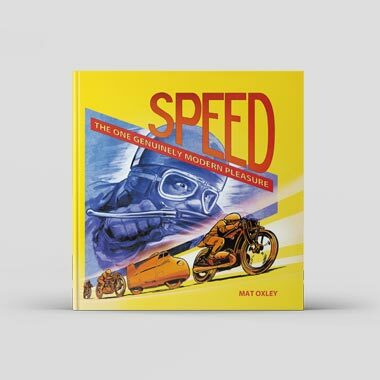 The two cars kept close company for some hours until Mark Dismore, 30 seconds behind the Jaguar just before dawn, pushed too hard and understeered off the infield track, nosing the Toyota into a straw bale. 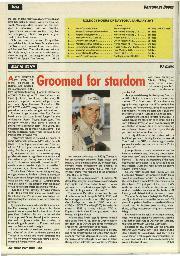 "I was stuck there in the mud until some corner workers helped push me out," said Dismore. "It didn't really hurt the car, but it did hurt my pride." Pressure was taken off the Jaguar for a while as the Toyota got back into the race five laps behind. A further 10 laps back was Fangio's Toyota and, right behind him, were the amazing GTS cars (formerly GTO), the Jack Roush Mustangs and NPTI prepared Nissan 300ZXs. 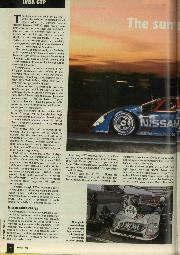 Back in seventh place, 36 laps behind, was the Momo Nissan driven by Gianpiero Moretti, Derek Bell, John Paul Jnr and Massimo Sigala; having lost 45 minutes in the fourth hour tracing a serious ignition problem and, subsequently, more time with broken seat mountings, they had all but resigned their hopes of victory. 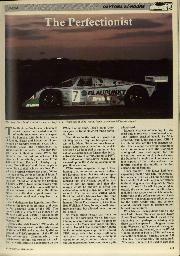 Geoff Brabham, four times the IMSA champion driver, was rather ignominiously put into a Nissan 300ZX. He found it disconcertingly difficult to drive, capable of running 200 mph on the banking but with little or no downforce in the turns, but warmed to the task when he found himself in fourth place overall at 10 o'clock Saturday evening. He was 13 laps down on the lead cars, certainly, but he led the invincible Jack Roush Mustangs and could have pitched for victory, eventually, had not the front pulley sheared off the crankshaft during the night. So Brabham, Dominic Dobson and David Loring got half a night's sleep, anyway, leaving John Morton, Steve Millen and John O'Connell to plug away at the Mustangs driven by such luminaries as Tom Kendall, Wally Dallenbach, Robby Gordon, Robbie Buhl, Jim Stevens, Mark Martin and John Fergus, most of them Roush's NASCAR stars. A mild electric shock passes through the enclosures when the leader has problems. Commentator Bill Bowser announced urgently at 09.52 that the lead Jaguar (US pron: Jag-war') had stopped at Turn 1, behind the pits, and driver Scott Pruett was out of the car. The TWR crew jumped aboard their motorised trolley armed with a complete gear linkage assembly, warned of the difficulty by Pruett via the radio, and within five minutes the right pieces were at Pruett's feet (unlike Le Mans, the rules allow the driver to be given the tools for the job). Pruett had to replace a broken link just above the gearbox, adjacent to the exhaust pipes. It was hot work, and up above the sun was rising, the ambient climbing over 70 deg F. All the European visitors thought of home, and shivered momentarily. Eyes turned to the Toyota, three laps behind and closing up fast . . . but wait, there's smoke behind the car and Moran is heading slowly for the pits! It looked like a terminal engine problem though in fact the transaxle was seizing up. Two crews of mechanics set to work feverishly, one lot pulling the back off the race car, the other stripping a fresh transaxle off a rear-end assembly behind the pit. Pruett won the contest easily, and 20 minutes later the Jaguar was lapping comfortably, extending its lead every time round. The Momo Nissan had caught the warring GTS machines and dealt with them, but Moretti fumed as a long, long caution period (apparently to remove a piece of unwanted bodywork from the front stretch) prevented Paul Jnr from scything away at the Toyota's advantage. Paul snatched second place at 11.10, and a minute later the Toyota boomed back onto the track. It had taken 74 minutes to replace the entire transmission and now the car seemed to be as good as new. 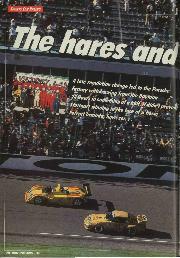 Ahead, though, Jones' Jaguar had a seemingly unassailable lead of 30 laps, nearly an hour in real time. Perhaps not, though. At 11.17 Jones brought the Jaguar in complaining that the engine was running roughly. The back came off, and a broken valve spring was suspected. The American continued, but only for another 15 minutes. He stopped again, this time with a gaping hole in a cylinder head, and Jaguar's race was over. "We were really nursing the car on Sunday," said Jones, sadly. "We were shortshifting, looking after it, and still this happened." It was well after midday when Sigala took the Momo Nissan into the lead, helped by Toyota's need to refurbish the brakes, and for 50 minutes a Nissan victory looked entirely possible, for the second year running. It would, for Moretti, have been the climax of his 25-year career as a privateer; for Derek Bell, a record-breaking ninth 24-hour victory. Fate decreed otherwise, though. At 13.20, with just 100 minutes of the race remaining, the Nissan's oil warning light shone in Moretti's face. Two corners further on the engine management system shut down, and the anguished Italian rolled to a stop at the end of the infield section. One minute later the Toyota Eagle regained the lead, and the rest was easy. Only seven and eight laps behind, though, were the two Jack Roush Mustangs, class winners for the ninth year in succession. But for propshaft replacements, an annual routine, they had been completely reliable throughout, a great credit to the Roush team. Only two one of the top 15 qualifiers reached the finish of the Rolex 24, and one was the Toyota which started from pole position and finished first. The reliability record was alarmingly poor, but the domestic V8s seem to show the way and create a good omen for the 1994 World Sports Cars formula.